Predator Artist Prints Available Soon! Happy to receive my artist copies of the recent licensed Predator print release through Mondo. I’ll have a limited quantity of my artist run, which is identical to the main release, though these will have the advantage of being signed and numbered.Main full color edition of 60, with 35 available for $85 each. The desaturated black/white/red variant edition of 35, with only 15 available for $100 each. *UPDATE: as a last minute add, I’ll be putting up one (ONE!) hand embellished, hand painted full color print in the drop as well, for $350. Still working on it nonstop, hope to have a photo soon! They’ll go up for purchase in my online shop this coming Wednesday, February 7 at a random time. As always, to get the exact drop time, be sure to be signed up to my newsletter in the sidebar of the site. The newsletter basically gets you direct access to all my new releases, as well as updates of what I’ve been working on, which for this year, is gonna be many many projects. Without further adieu, here are full details about the prints! Thank you! Print size: 24″ x 36″ limited artist edition of 60. ONLY 35 AVAILABLE. Eight-colors on bright white stock. $85 each. Print size: 24″ x 36″ limited artist edition of 35. ONLY 15 AVAILABLE. Two-colors on bright white stock. $100 each. A new licensed poster release through Mondo! Once again, I’ve partnered up with Mondo to release a new licensed movie property poster. I’m thrilled to announce my officially licensed “Predator” print available now through Mondo and 20th Century Fox. This is our second officially licensed project together (Alien was the first), and it’s finally ready for purchase. This was a more technically challenging poster as the Predator creature had a ton of specific bits and pieces to get right. Stan Winston’s creature shop design was amazing, and nailing all the particular details was a unique challenge. Needless to say, I had fun with this one and even managed to put in a few new color experiments to push new ground from my last few posters. And yes, the piece is intentionally designed to work on it’s own, but also be a companion piece to the “Alien” poster. Pushed a couple of extra colors this go ’round and am really pleased with the final result. Print size: 24″ x 36″ limited edition of 325. Eight-colors on bright white stock. $50 each. Regular edition available through Mondo Tees here. Print size: 24″ x 36″ limited edition of 150. Two-colors on bright white stock. $75 each. It’s almost time, and I’m champing at the bit for it to get here. Last year was my first time, and besides being a nonstop exhausting onslaught of drawing, painting and talking with so many wonderful people and other artists, the convention itself was a total blast. This year I’ve tried to take what I learned from last year and try to refine my convention experience and up the ante in terms of products. Let’s get to it! 0. 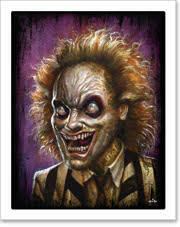 “From the Upside Down” Original and Limited Edition giclée art print. Just finished in the knick of time, I’ll have a new print based off the amazing “Stranger Things” show phenomenon. Seriously, if you haven’t seen it, go Netflix-binge it tonight. It grabs you by the nostalgic 80s thriller and never lets go. Fantastically executed, seriously, just go check it out right now. I tackled the Demogorgon from the show, so I guess SPOILERS in a way, (but still, the show isn’t spoiled, go see it) and gave him some floral camouflage to better navigate the real world. The original painting will be at the convention, available at the crazy low Mondocon price of $1000. If unsold, it will increase in price when it goes online for purchase after the show. The prints are archival fine art giclée prints on 100% cotton rag and super limited to an edition of 30. ONLY 15 will be available at Mondocon, so if you’re interested, grab one early! Prints are 9″ x 12,” each hand signed and numbered and available for $40 each. Pen/ink, ink wash & acrylic on paper, varnished. Available at special convention price of $1000, will go up if unsold after the show. Print size: 9″ x 12″ Limited edition of only 30. ONLY 15 AVAILABLE AT MONDOCON! Archival giclée print on 100% cotton, each print is hand signed & numbered. The first item up is a brand new screenprint, my largest and most elaborate to date. “Mortal Coil” is an 18″ x 24″ four color screenprint in two different colorways, masterfully printed by Danny Askar of Static Medium. Danny has been incredibly patient and forthcoming with a ton of helpful info to help me streamline my screenprinting process. While my background is in print production, and I have trapped artwork to prepare for silkscreen printing on apparel in the past, I’ve rarely created my own work for silkscreen production on paper. My fourth screenprint to date, I’ve pushed myself as hard as I ever have and am thrilled with the final results. The prints are printed on Madero Beach 100# speckletone, each print hand signed and numbered. Regular edition colorway prints with a lustrous purple are limited to 80 prints, while the variant colorway in more muted browns and blues is limited to only 40 prints. Regular edition prints sell for $50, and the variants are available for $55 each. Print size: 18″ x 24″ Limited edition of 80. Four-color hand-pulled screenprint on Madero Beach speckletone 100# cover stock. Each print is hand signed & numbered. $50 each. Print size: 18″ x 24″ Limited edition of 40. Each print is hand signed & numbered. $55 each. 2. Original Drawings and Paintings. In addition to the new screenprint, I’ll have several small original drawings and paintings, same as last year. This year though, expect a little more detail as I sort of got sucked into the screenprint process and went on an ink jag for a while with an emphasis on intricate linework. I’ll be working up until the doors open to have as many available as I can. Prices will range from around $100 to $250, depending on size and complexity. Ink on paper, various sizes. Yes, sketchcards are back again. I’ll have a selection of my newest screenprinted sketchcard, printed on Stonehenge printmaking paper, slightly larger and more detailed than the ones from MondoCon 2. This time, however, I’m sticking to black and white or sepia. Yep, just one color this year, as attendees from last year may remember me working feverishly to try and stay ahead of the requests, and this year I’d like to actually be able to look up on occasion. I’ve also slightly bumped the price because last year’s was a little on the low side as a test, and the test succeeded (or failed, depending on your point of view). I’ll take SIMPLE requests, and WITHIN REASON. Sketchcard ideas are subject to the artist’s discretion- this is for both of our benefit- it keeps me drawing happily and gives you something that will best showcase my talents. They’ll be available until they’re gone, I only plan on bringing about 40 this time, as I think at final count, I ended up doing over 80 last year (!!!). First come, first served, $40 each, while supplies last. LIMITED QUANTITIES (ABOUT 40), WHILE SUPPLIES LAST! One color screenprint on Stonehenge Printmaking paper. Each screenprinted sketchcard print will feature an original hand drawn sketch, done live. Each sketchcard is hand signed and numbered. Regular one color black or sepia simple pen/ink sketch cards $40 each. each card is hand signed and numbered. Recently I had a limited edition print drop from 1xRUN for the KAABOO festival in Del Mar, California. Commissioned for one of the music stages, I was honored to have the art alongside such acts as Chris Isaak, Macy Gray, Collective Soul, The Goo Goo Dolls, Blues Traveler, and several others. I’ll have a few artist proofs left of the 17″ x 17″ super vibrant seahorse print “Duality” available for purchase for $60 each. Each print comes with a hand signed certificate of authenticity signed by 1xRUN and myself. Very limited quantities remain. 17″ x 17″ Archival Pigment Print on 310gsm Museum Natural Fine Art Paper. Limited edition of 75, each hand-signed and numbered. Comes with certificate of authenticity from N.C. Winters and 1xRUN. $60 each. limited quantities remain. In addition to prints of “Duality,” I also have a few left of my recent commissioned Blinky fish from The Simpsons.“Two Cars in Every Garage and Three Eyes on Every Fish” will be available for $40 each, very limited quantities remain. Limited edition of 30, each print is hand signed & numbered. I will have some of my enamel pins from Yesterdays available for purchase as well. “Avion” artist edition pins are available in two colorways: “Fire” and “Ice” and will be available while quantities last for $12 each. 1.25″ soft enamel black nickel plated lapel pin w/ single post black rubber backer. Available in two colorways: “Fire” and “Ice” for $12 each. All remaining, unsold works will be available after the convention (but give me a few days to get home and recover). Keep an eye on my Facebook art page for details on post-show drops. You can find me the same place as last year, in Arsenio Hall, looking on the left hand side and down the aisle as you walk in, at booth #B18. I’ll have a few more surprises and a couple more drawings, as many as I can get done before the doors open, or my hand falls off, whichever comes first. I’m very excited for the show and looking forward to seeing so many people who I’ve had the pleasure of interacting with in the art community online, but who I so rarely get the chance to see in person. Hope you’re able to make it out to Austin to Mondocon 3 this weekend, it should be a blast!